Bacon bits, 1/3 cup of shredded Parmesan cheese, an avocado cut into pieces, Romaine lettuce and almond-coated white-meat chicken combine to make an elegant, high-protein luncheon dish. I top this low-carb salad with home-made ranch dressing, which I create from mayonnaise, buttermilk, and/or sour cream, mixed with onion and garlic powders and dried parsley. When I don’t have the powdered onion and garlic, I will dice bits of fresh ones very fine and sauté them before mixing with the other ingredients. Add salt and green or white pepper to taste, then blend with a wire whisk. 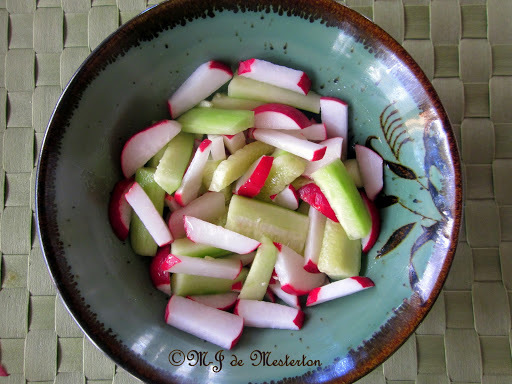 This refreshing and elegant cucumber-radish salad is dressed with a rice wine vinegar-honey vinaigrette.